This is a FAVORITE at our house! Taylor & Phoebe like it better than regular pasta when we have red sauce. Heat the oven to 400 degrees. Spray the dish, and use a fork to prick holes in the squash. I do several. Cook/Roast it for an hour at 400. Turn it once about halfway through cooking time. Once an hour is up, turn off the oven and leave the squash in for another 10 minutes. When the squash is cool enough to handle, cut in half. Scoop out the seeds, then use a fork to scrap away the “spaghetti.” Serve with red sauce, OR just add some butter & salt. 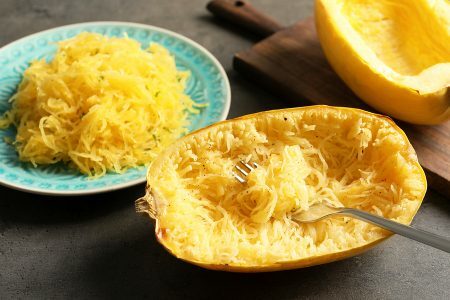 That’s the first time I have ever heard of someone cooking a spaghetti squash without cleaning it first. I always cut mine in half and clean out the seeds and slimy stuff first. Then place them open side down on parchment paper with some olive oil on it. Brush olive oil on the outside of the squash, salt and pepper both sides and poke holes in the skin, then cook for an hour at 350 degrees. If you can’t easily poke a fork in the skin by that point, leave in oven for another 15 minutes. Yummy. No butter needed because the olive oil gives the squash a yummy flavor already. I like it sprinkle grated Parmesan on it and toss it with some more olive oil and salt. Mmm. It is also awesome in the Instant Pot. You can ‘finish it off’ in the oven, too. Our son whose 6 us quite the foodie like his mommy and dad too loves it! We like the squash with my newest creation.. supergreen and fresh parsley pesto made with walnuts in place of pine nuts and much more affordable and has lots of nutrition using spinach and kale. This is the first one I have ever cooked. My Aldi had them 99cents each. Figured I could lose a dollar. LOL. Followed Jodi’s instructions. Added a little butter and some Trader Joe’s 21 seasoning. Better than I expected…but is it still supposed to be a little crunchy? Or like real spaghetti? Thanks for the recipe!